For me, the sine qua non of Jewish food would have to be gribenes. 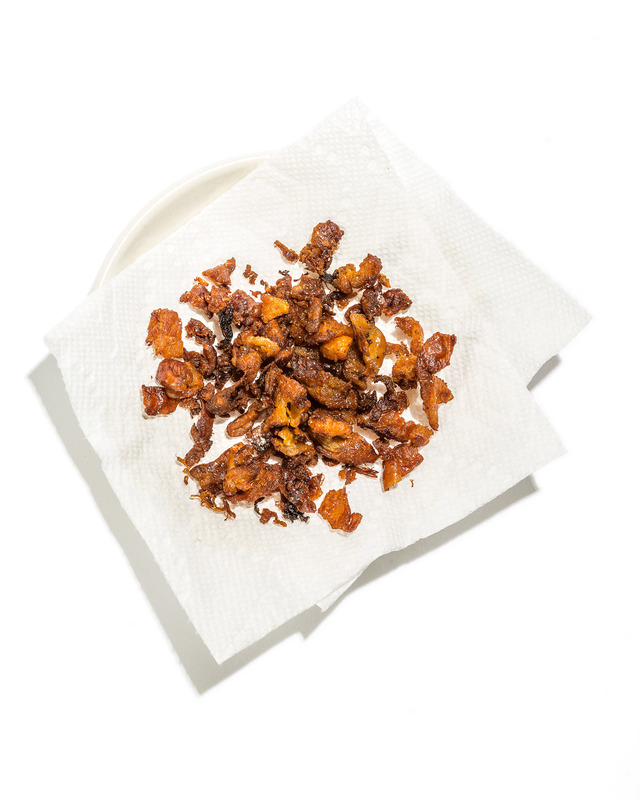 They are deceptively simple fare—chicken (or goose) skin and onions fried in chicken fat. You can’t go wrong with these ingredients. The snack’s origin is shrouded in mystery, but apparently it all began somewhere in medieval Germany. I picture the shtetl version of the invention of Reese’s Peanut Butter Cups. A Teutonic balaboosta was rendering goose fat, when—oy!—some onions fell into the pan, and the kosher version of pork rinds were born. My own connection to the food goes back to my childhood. My paternal grandma, Jean Malina—aleha ha-shalom—used to make gribenes as a treat every Pesach. My family would arrive for Seder, and she would take me aside and hand me a plastic container filled to the brim with crispy goodness. I was then left to dispense the tasty morsels to the rest of the mishpacha. That I was given container privileges is my strongest argument that I was her favorite. I didn’t start cooking myself until my wife, Melissa, got pregnant, so—to my great regret—I didn’t learn to prepare gribenes at Grandma Jean’s side. But I do consider it a tribute to her memory when I make them every Pesach. I like to think that the fumes reach up to Gan Eden, and she knows she’s remembered with love. Want to make them yourself? You’ll need a pound of chicken skin with a little fat on it (two pounds is twice as good). This you should accumulate during the year, when you make soup. Cut the skin into small pieces and place it in a pan on low heat. Salt it, add a tablespoon of water, and cook for about 20 minutes. When the fat starts to render, toss in a couple chopped-up onions and cook until crispy. It takes a long time! Read a good book. For an elegant vegetarian version, simply don’t eat anything at all. If gribenes be the food of love, fry on! Joshua Malina has been an actor for 29 years and a Jew for 52.